The 2nd International Conference on Chemical Education and Sustainable Development took place 16–18 November 2004 in Moscow, Russia. It was held at D. Mendeleyev University of Chemical Technology of Russia and at the headquarters of the Russian Academy of Sciences. The conference was sponsored by IUPAC, the Russian Academy of Sciences, the Russian Regional Environmental Center, the Department of Usage of Natural Resources and Protection of the Environment of Moscow Government, and the Institute of Chemistry and Problems of Sustainable Development of the D. Mendeleyev University. The conference was dedicated to the U.N. Decade of Education for Sustainable Development (July-August 2004 CI, p. 3). In December 2002, the U.N. General Assembly adopted a resolution to observe a U.N. Decade of Education for Sustainable Development, lasting from 2005 to 2014. Education as the foundation of sustainable development was reaffirmed at the Johannesburg Summit, as was the commitment embodied in Chapter 36 of Agenda 21 of the Rio Summit in 1992. Education was recognized as a tool for addressing important questions such as rural development, health care, community involvement, HIV/AIDS, the environment, and wider ethical/legal issues such as human values and human rights. There is no universal model of education for sustainable development. While there will be overall agreement on the concept, there will be nuanced differences according to local contexts, priorities, and approaches. Each country must define its own priorities and actions. The goals, emphases, and processes must, therefore, be locally defined to meet the local environmental, social, and economic conditions in culturally appropriate ways. Education for sustainable development is equally relevant and critical for both developed and developing countries. That is why more that 250 participants from Russia and CIS countries, as well as from Greece, UK, Italy, USA, and Iran gathered in Moscow to share ideas and thoughts. Attendees represented different levels of educational systems, academia, and research institutions. 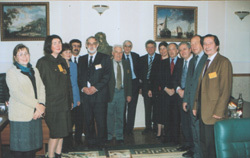 (L to R) E. Lokteva (Russia), N. Tarasova (Russia), L. Tryetyakova (Russia), A. Taherpour (Iran), D. Meadows (USA), [Bronze Head of D. Mendeleyev], G. Yagodin (Russia), O. Nefedov (Russia), P. Sarkisov (Russia), C. Otter (UK), P. Atkins (UK), P. Tundo (Italy), V. Ivanov (Russia), and V. Petrosyan (Russia). The scientific level of the symposia was very high as evidenced by intense discussions after the presentations. Representatives of the chemical industry, NGOs, researchers, and educators exchanged thoughts and ideas. The poster sessions were also very lively, with the students and young researchers presenting their data with great enthusiasm. Two one-day satellite workshops for high school and college chemistry teachers attracted a lot of attention. The workshop “What Sustainability Really Means for Us” (Organized by D. Meadows) demonstrated how to use interactive methods while teaching complex problems of systems dynamics. Meadows was the leader of the research group for the Club of Rome’s project in the early 1970s that resulted in the famous publication The Limits to Growth. The workshop “New Technologies in Chemical Education: Salters Chemistry” (organized by Chris Otter, University of York, UK, and T. Myassoedova, D. Mendeleyev University, Moscow) aimed to introduce the Salters approach to Russian-speaking countries. The second Russian edition of Salters Chemistry will be published in May 2005, so the teachers had an excellent chance to pose questions about the content and the context of the book. The final general discussion during the last plenary session showed the similarity of problems faced by chemistry education in different countries: chemophobia, financial issues, and difficulties in the implementation of interdisciplinary programs. The participants adopted the Recommendations of the Conference, which have been forwarded to the official bodies of the Russian Federation and CIS countries. The United Nations Decade of Education for Sustainable Development was officially launched on 1 March 2005 in New York. The UN Secretary-General Kofi Annan and UNESCO’s Koïchiro Matsuura were present at the ceremony. Following the international launch, a series of regional and national launches of the Decade will take place throughout 2005. The International Conference in Moscow might be considered the forerunner of the Decade. The chemists and chemistry educators who came to Moscow helped fulfill the IUPAC mission as they contributed to the worldwide understanding and application of the chemical sciences, to the betterment of humankind. For more information and abstracts of papers from the conference, please refer to the Web site <www.muctr.ru/~congress2/index2.htm>. For background information on the UN Decade of Education for Sustainable Development, and an electronic version of the Draft International Implementation Scheme for the U.N. Decade of Education for Sustainable Development, please refer to <www.unesco.org/education>. Natalia Tarasova <tarasnp@muctr.edu.ru> is director of the Institute of Chemistry and Problems of Sustainable Development at D. Mendeleyev University of Chemical Technology of Russia. She is a titular member on the IUPAC Committee on Chemistry Education.